Donald (Tyler Parr) is a social worker and a normal, everyday guy. After he spends a night out at the bar, he wakes up late for work. He quickly rushes out of his house, but the odds seem to be against him on this particular morning. He can’t seem to understand how his morning could be any worse. After finally arriving to work he quickly realizes - what he has gone through is unlike anything his first client (a homeless man named Charlie) has gone through within the last 24hrs. Here we see the existentialism slowly emerge as Charlie lays his life on the table. How will Charlie's fate be left; in the hands of a disgruntled social worker or his own? In his directorial debut short film Dragonfly, which played at the Cannes Film Festival in 2012, Tyler Parr found the beauty in the simplest things. In Ironied, he has done it again. Parr is proving to be one of South Western Ontario’s most promising figures in independent filmmaking. 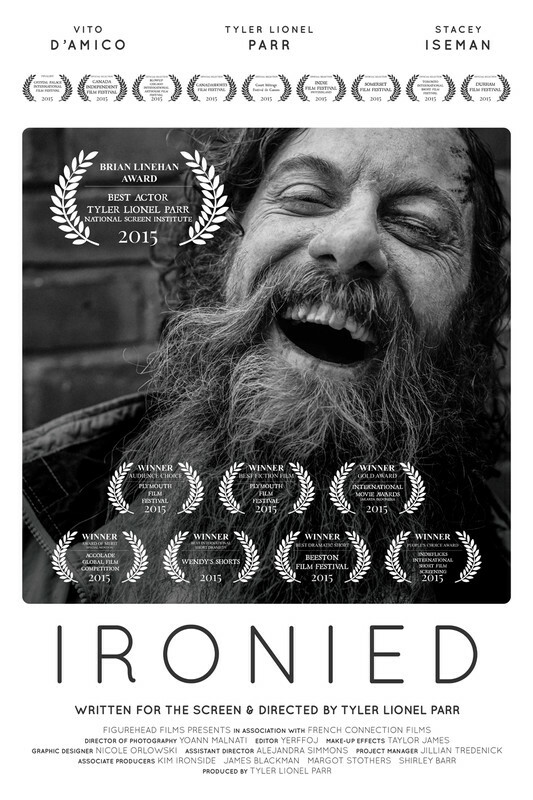 Ironied is a beautifully written and photographed drama about the irony of life. It’s about finding perspective. When you think it’s as bad as it could be, there’s someone near you who has it even worse. Tyler has been an avid performer in theatre for the past 30 years in such shows as West Side Story, Hamlet, Art, Romeo & Juliet, History of the Devil, Trojan Woman and August:Osage County. He has won several awards for his roles in comedic and dramatic productions such as George F. Walker’s - Problem Child and funniest comedic show - Fully Insured. Tyler has just recently been awarded the National Screen Institute of Canada - Brian Linehan Award for Best Actor (Ironied). He has been nominated for best actor in shows such as Daniel McIvor’s - Never Swim Alone and the notable Yazmina Riza’s - Art. He has performed and toured throughout Canada and performed in shows as far abroad as Prague and Turkey with the auspicious group Black Hand Theatre. He has appeared on several television shows such as ‘Curious and Unusual Deaths, Breakout, Inventions That Shook the World, The History Network, CBC, Discovery Network and commercials, as well as many principal roles in independent short films. Born in Woodstock Ontario, Canada, he has lived from coast to coast and is currently living in Toronto, where he works as an actor, director and filmmaker. Tyler is the owner and Artistic Director of Figurehead Films. Figureheads first film, Dragonfly, was accepted into the Short Film Corner at the 2012 Festival De Cannés and the Toronto Independent Film Festival. Tyler Parr is planning to attend the screening and Q&A at the Forest City Film Festival.